MODBUS Module: Converts 4-20 mA signal to MODBUS. Proposed design that can fit into the back of a family of gas detection products that takes the 4-20 mA signal and converts it into a MODBUS signal. Design allows access to the relays on the gas detector. 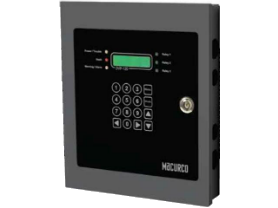 Firmware upgrades on detector and panel allow for automatic detector identification. Daughter PCBA on panel allows for MODBUS communication over serial port. Addition of addressable MODBUS communication expands panel capacity from 12 analog to 99 sensors – 12 analog and 87 MODBUS.